An editorial comment before starting: In case you missed it, there is no flash and dash to my headlines for Possession with Purpose. My intent here is not to create a misconception about what the Indices and corresponding statistics show. Statistics, when effective, are not based upon emotion; they have value because they lack emotion. The trick has always been, from a management standpoint, to balance the value of metrics with the value of knowledge in how the game of soccer is played. With that said there are a few changes (as expected after just five weeks) to these Indices - I'll dig into those, but first as always, here's a link to my original article on American Soccer Analysis in case you aren't familiar with my methodology. It's still early so teams may move around quite a bit. Consider how last year took shape: it wasn't until the 15-17 week time-frame where teams settled in, and even then we saw FC Dallas take a marked nose-dive in PWP. Put another way; by Week 17, last year, eight of the ten teams to make the MLS Playoffs were in the top ten and pretty much stayed there the rest of the way. By 2013 season's end this Index had correctly identified nine of the top ten teams with only Houston as the outlier at 12th. The Capt. Obvious here is FC Dallas have moved up top while Columbus, who lost 2-nil to Toronto have slid back to 2nd. As for the bottom dwellers (somebody has gotta be there)... San Jose, Chivas and New England - more to follow there when digging into the Attacking and Defending PWP Indices. Houston was off to a good start this season (4th in PWP last week) but they've dropped to 10th best this week. Much of that had to do with a red card to center-back David Horst and the three goals scored by Dallas less than 15 minutes after his exit. This drop is one of those early season moves that might be expected with such a low sample size - by Week 12 or so a one-off game like this for a team might not create such a large impact in the Index rating. Real Salt Lake completely hammered Toronto two weeks ago - yet this week, a big surprise for me, Toronto turned around and beat Columbus, in Columbus. That great result for Toronto saw them move up from 17th to 12th. Other movers include Ben Olsen's squad. DC United was dead last after four weeks and are now tucked in at 12th, behind Portland. As the year progresses I will begin to offer up a few snippets for your consideration on the upcoming games while leveraging the PWP Indices. I'm not sure if you want to call these prognostications or not - that's up to you - but in looking at the Indices and understanding all the analysis behind how they are created here's my thoughts for this weekend. Colorado at Toronto - Tough one here but I am going with a win to Colorado. It's early yet and the Rapids remain a strong attacking team, even on the road (4 points on the road already). That coupled with numerous injuries in Toronto I see the Rapids taking 3 points against the depleted Reds. I wouldn't bet the house on any of these offerings - I'd suggest they are no more or less valuable than what others following MLS soccer might consider. For the record though - after Week 15 completes I will begin to keep official track of my prognostications leveraging the PWP Indices. Here's where it gets interesting. Note that Philadelphia, New York and Chicago Fire are fairly high up in the rankings while Toronto and Sporting KC are a bit lower. 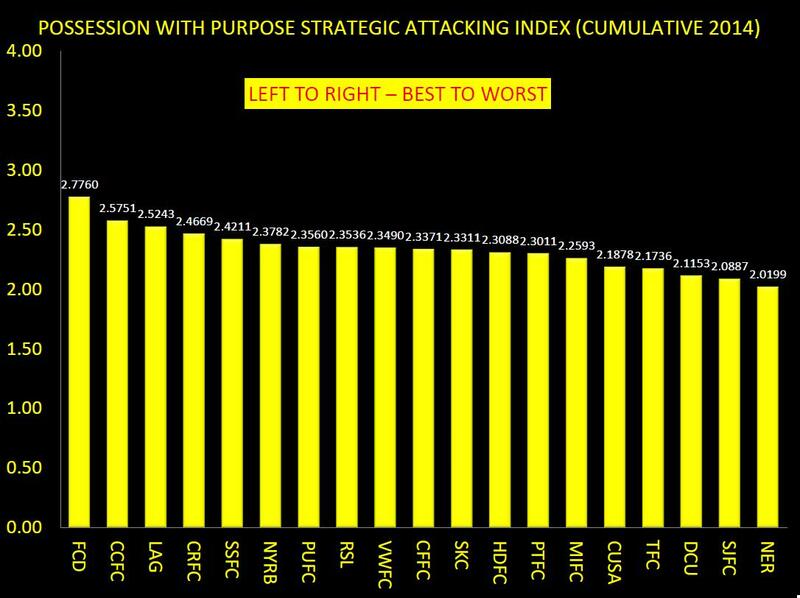 This is where you can get an idea on what teams tend to focus a wee bit more in attack and what teams might not. So for example, when looking at New England, they have had just one home game so far this year. They've been shutout by Vancouver and in three of their four road matches they didn't score a goal. The only team they have beaten this year is San Jose, a current bottom dweller for most of the first five weeks. It's that overall Index rating that helps me shape my pick that Houston will beat New England given their current performances. Chicago... This team does not resemble the attack pattern of old Chicago that Yallop left behind and abandoned in San Jose. There is more grist on the ground this year and if the defense gets better they should be pretty good. The LA Galaxy have moved into the top spot in place of Columbus while Houston took a huge nose dive with the red card to Horst. 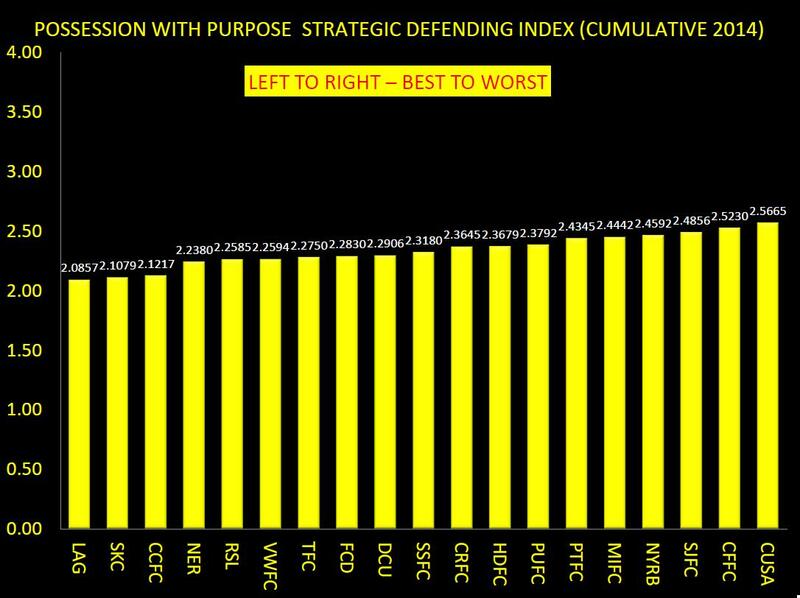 Four goals against (one being an own goal) to FC Dallas will significantly influence this Index that early in the season... note Houston went from having the second most effective defense to the 12th most effective defense. Creeping up further this week was Sporting KC. Last year they were tops for the 34 game regular season and this week they climbed from 5th up to 2nd with that game against Real Salt Lake. It's quite an achievement for Sporting to get a clean sheet against that wicked-good Diamond 4-4-2. Vancouver continues to stay in the top 10 for Defending PWP. Last year they were horrid in defense and every week they stay in the top ten is every reason to consider betting they will make the playoffs. Last but not least Toronto are sitting in 7th place in Defending PWP. Defense will win you championships. The rebuild, though looking more geared to improve the attack, has had a strong influence on the defensive side of the pitch. As noted earlier it appears they have a number of injuries --- to long to list --- so here's a link in case you are interested. Clint Dempsey had a great 20+ minutes for Seattle this past weekend and it looks as if Schmid may have found the right area for him to operate in. That's bad news for the Western Conference as a whole and in particular for Vancouver and Portland as they also vie against the Sounders for the Cascadia Cup. How Dempsey settles in will be interesting especially if Kenny Cooper returns to his goal scoring days while in New York. The system might be a wee bit different but Cooper does well when there are others around him who can score and create good space by their mere presence on the pitch; Dempsey does that like Henry does that for New York. All else considered the only teams I really haven't talked about that much about are Montreal and Chivas. I have no idea how Chivas will do this year. Their match this weekend in Portland is an early statement match for both teams. If Chivas takes it on the chin it is likely they retain the doormat award in the West again this year. 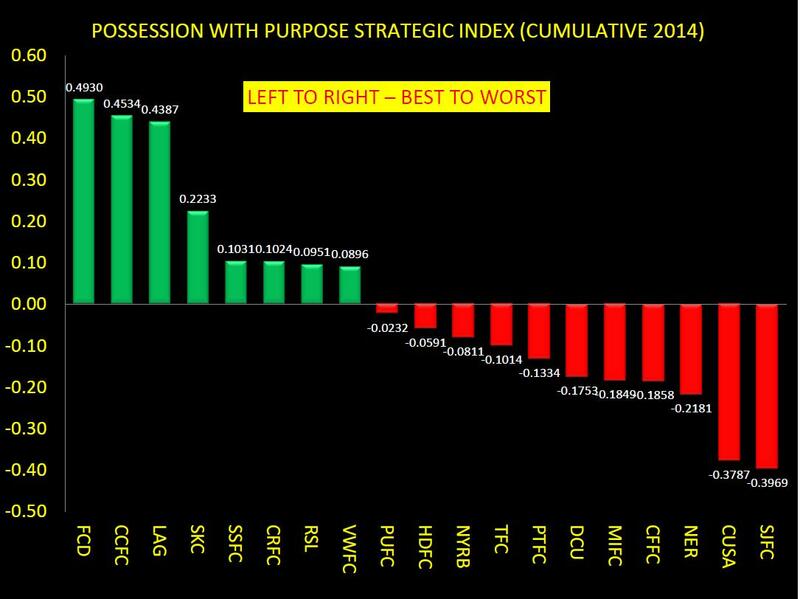 Five games in, Montreal are 5th worst in Defending PWP and 6th worst in Attacking PWP. Bottom line here is they aren't good on either side of the ball, yet. If I had an early season prognostication it would be Montreal will be the doormats of the Eastern Conference unless Jack McInerney brings some magic with him. All the best, Chris You can follow me on twitter here @ChrisGluckPWP.